Letterpress has gone through such an incredible rebirth over the past decade. What is they say? Everything old is new again. Letterpress is by far the most requested printing method for our invitations, and it is the default for most of our lifestyle stationery. Because of it's popularity, I thought I would share a little something about what Letterpress is. But I don't want to reinvent the wheel, either. There is a short documentary below - about 6 minutes - that is worth the watch. Now, granted, I don't go into as much detail as Firefly press - there is no casting my own type. I admit to being more of a modern letterpress girl, meaning that when working on a client job, I use a program like Adobe Illustrator to create my layout and set my type, then send it off to have a custom cut made. This is what makes letterpress affordable, otherwise I'd be charging hours and hours to make ready for a single job, and imagery would be a lot more limited, too! For art prints, I tend to set type the old fashioned way. You can see my handiwork in the technique here and here, with more art prints soon to come. I am a studio renter at Pratt in Seattle so this is where all my magic happens. More specifically, I usually work on Franklin. Say hello! 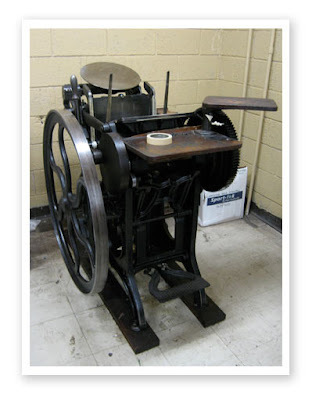 Franklin is a Chandler & Price Platen Job Press. No motor on this guy so you get a bit of a workout making him go. He's a clankity little bugger, but fast so we forgive him!